Diwali is the Festival of Lights. This Light is symbolic of the spread of Knowledge. What is this Knowledge that is still alive in this wonderful country which we call India? Firstly and foremost: ‘I accept you; I accept that you may be White or Black, Red or Yellow, Christian, Buddhist, or Muslim. I accept that God may manifest at different times, under different names, using different scriptures. Thus God is Krishna, but also Jesus Christ, Buddha or Mohammad.’ This is an extraordinary statement and a marvellous instrument towards world peace, at a time where terrorism is striking everywhere in the world in the name of One God. It is also a Knowledge that only the body dies, but not the soul, which is born and reborn again till it achieves perfection. A Knowledge that whatever you do bears consequences in this life or another. A Knowledge that all human beings are made out of Love, even beneath the hate and the killings. Hatha yoga, India’s gift to the world, which has been copied and imitated everywhere. Meditation, this extraordinary technique of coming back to one’s Self, of settling the mind and the body, which is today practised by millions around the world — another bequest of India to humanity. Pranayama, the science of respiration, perfected by Indians for three millenniums. This knowledge thus does not only belong to Hindus, but also to the Buddhists, Christians, Jains and Muslims of India. Once upon a time, the Syrian Christians of Kerala [Images], though they remained faithful to the word of Jesus Christ, had incorporated some basic tenets of Hinduism such as reincarnation and karma. Once upon a time, great Sufis such as Dara Shikoh, Shah Jahan’s eldest and preferred son (who should have become emperor instead of Aurangzeb), while remaining true Muslims (and not apostate ones), could translate the Upanishads and step into a temple without thinking they were committing a mortal sin. Once upon a time, Sikhism was born out of Dharma, to defend the Hindu Dharma and neither Sikh nor Hindu saw any difference between themselves. Once upon a time, Buddha, although he did strike against ritualism and hereditary Brahmanism, did not found a religion, but a path that led to the same Ananda he came from. This knowledge is unique to India. For the West has lost the truth. We have lost the Great Sense, the meaning of our evolution, of why so much suffering, why dying, why getting born, why this earth, who are we, what is the soul, what is reincarnation, where is the ultimate truth about the universe. And this will be India’s gift to this planet during this century: To restore to the world its true sense; to recharge humanity with the real meaning and spirit of life. Thus, if you are an Indian settled abroad, whatever your religion, you should carry that identity in your actions and your aura, that you may shine without words, for it is a great privilege and responsibility to be born an Indian. Yet, too often, Indians in the US or Canada [Images], or even the UK for that matter, hide their identities and try to merge into the mainstream culture, becoming more American than Americans, more British than the British. Sometimes Indians are even ashamed to say that they are Indians and it is a tragedy to themselves and to their children, who lose the connection with one of the most ancient cultures in the world, which is not a religion but the last living spirituality on this planet. You should also know that today this Knowledge is under attack from all sides. Foremost, from the Globalisation and Westernisation which is taking place at the moment in India at a frantic pace. Television channels and advertisements must be the biggest culprits. Is white the most beautiful colour, does having a white skin make you so hep? Do a cell phone, a suit or a fancy car really make you a man? This is what millions of innocent villagers or lower middle class viewers are enticed to believe. There is also a rapid Christianisation of many villages in India, whether in Tamil Nadu post-tsunami, or in the North-East where innocent tribals are converted with the help of million of dollars. What about the radicalism that seems to grip some Muslim youth? Nowhere but in India do they have so much freedom to practise their faith. And we know that the Pakistani or Bangladeshi bombers in Hyderabad or Mumbai could never function without the active participation of some Indian Muslims. Lastly Hindu renegades, those intellectuals who want to cut off India at any cost from her past and make a copy — however brilliant — of a Marxism which has died everywhere else, or of the United States of America, where violence, divorce and depression are affecting three persons out of five, are extremely active at the moment, thanks to a government who chooses to close its eyes while this is going on. Yet, it is for this Precious Knowledge that all Indians, be they Hindu, Muslim, Christian, or Sikh, should retain their dharmic identity, while being faithful to their Creed or Supreme God. This Diwali thus should symbolise for all Indians, the rekindling of this Light in their hearts. Let Mother India protect shine in them and rekindle their common indentity beyond their religions. A Happy And True Diwali to ALL Indians. Dara was born on 20 March, 1615. He was the eldest son of Prince Khurram (later Shahjehan), the heir apparent of the emperor Jehangir. He was, however, about twelve years old when along with Aurangzeb (three years younger) he was sent as a hostage to his grandfather after the failure of Shahjehan’s revolt. When Shahjehan took over the throne in 1628, he made no secret of his desire for Dara to inherit the throne from him. he got married in 1637, he immediately developed an obsession for his wife that was to last till her death shortly before his own. He was formally initiated in to Qadiriyya ?ufi silsila by Mulla Shah into the Qadiriyya silsila sometime in 1639 or 1640. In 1640 he initiated formally into the Qadiri Order of Sufism, and the same year he came up with his first book, Sakinatul Auliya. It was a collection of biographical sketches of notable Muslim saints. Dara’s intellectual pursuits took a steep turn upon his meeting Baba Lal Bairagi, a Hindu Gnostic. Dara has recorded his conversations with Baba Lal in a short book titled, Mukalama Bab Lal wa Dara Shikoh. FAiled attempt invasion of Qandahar in 1655, where Shahjehan finally agreed to allow Dara to lead an army. in 1657, Dara Shikoh came out with his greatest masterpiece: Sirr-e-Akbar (The great secret), a translation of the Upanishads into Persian. Completed in 1657 with the help of several pandits from Veranasi Dara Shikoh’s translation of Upanishads is usually regarded in high esteem by the scholars in that field. It is also suggested by some historians that the Persian translation of Upanishad probably made it most accessible to the Europeans of the time as they were more familiar with the Persian language than they were with Sanskrit. In 1657, Dara Shikoh was 43, Shah Shuja 41, Aurangzeb 39 and Murad 33. All of them were governors of various provinces: Dara was the governor of Punjab, Murad of Gujarat, Aurangzeb of the Deccan and Shah Shuja of Bengal. Two of them emerged as clear frontrunners in the race: Dara Shikoh and Aurangzeb. In 1658, Shahjehan fell ill and Dara took over as the acting emperor, just as was expected of him. Aurangzeb quickly made a coalition with Murad and defeated Dara Shikoh at the famous Battle of Samogarh. Once, Dara Shikoh (the eldest son of emperor Shah Jahan), came to Guru Har Rai asking for help in the war of succession with his brother the Murderous Aurangzeb. The Guru had promised his grandfather to use the Sikh Cavalry only in defense. He, never the less,helped him to escape safely from the bloody hands of Aurangzeb’s armed forces by having his Sikh warriors hide all the ferry boats at the river crossing used by Dara Shikoh in his escape. Two months after his coronation in June 1659, Aurangzeb enacted a speedy trial of Dara Shikoh where the judges declared him a heretic and the unfortunate prince was condemned to death in August 1659. It is said that when Dara saw his executioners approaching him he declared that a prince must never die without putting up a brave fight. A kitchen knife was all he could lay his hands on, and he went ahead fighting the swords of his aggressors with this pitful weapon. He was eventually assassinated and it is said that the city of Delhi was shrouded in official mourning when the body of Dara Shikoh was displayed in its streets. He was later laid at rest, quite aptly, inside the premises of Humayun mausoleum. the elder son of Emperor Shãhjahan( r. 1627-1658 AD.) fell ill. Inspite of the best efforts of Hakims. he could not be cured. The rare medicine needed for his ailment was nowhere available. Information reached the Royal Hakim that required medicine was available with Guru Har Râi (1630-1661 A.D.). He came personally to the Guru Sahib and requestcd for the medicine. 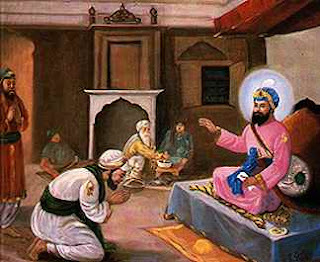 Guru Sahib gave him the rare medicine required for the treatment and also sent a pearl which was to be ground into fine powder and taken with the medicine.